VENICE – Never enough can be said about the romantic attraction of this city. Countless movies, novels, and books have been dedicated to the mysterious and beckoning atmosphere of the lagoons' city. The beauty of Venice, in any season of the year, is truly unique. Its unmatched architectural style, a blend of many cultures, is the backdrop for an unforgettable honeymoon. FLORENCE – The popularity of this city is known throughout the world. Its rich past and civilization can be appreciated from any corner of the city. Magnificent palazzos, beautiful churches, and museums, which are the home to some of the world's most priceless paintings and sculptures, are a joy not only for the eyes but for the soul as well. It goes without saying, that shopping in Florence is a rare pleasure. Florence and all of Tuscany, for that matter, are also known as famous culinary destinations, boasting excellent restaurants that offer a wide range of local specialties accompanied by the much talked about super-Tuscan wines. than in the cradle of civilization that is Rome! Let the wonder and glory of Rome enter your souls with intimacy that will inspire an incredible scrapbook of memories. 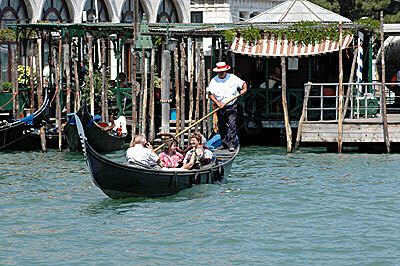 This package includes airport transfers, a romantic gondola serenade and an orientation sightseeing excursion. Additional nights, excursions and features can be added to this package, and it can be combined with other packages. Airfare not included in the price, we offer competitive airfare rates with the purchase of this package. Please, call for information.